For centuries, we human beings are used to having separate worlds in our lives. Our parents, our friends, our managers, our peers, our teachers, our children – the list goes on. We often maintain different personalities with the different worlds and rarely are we comfortable with details about who we are in one world leaking into one of the other worlds. As a diehard Seinfeld fan, this brings to mind George’s fear of colliding of worlds (Independent George, Relationship George) as Jerry happily hooks up Elaine and Susan! When I read articles such as the NYTimes one on “They Loved Your G.P.A. Then They Saw Your Tweets“, I always come away with mixed feelings about what role the social networking landscape should play on one’s life – in this case, education, perhaps something else in another case. This is certainly not the first article written about the reality of colliding worlds and it won’t be the last. As we become more trackable via sensors, the problem of collisions is going to be huge. As a society, are we really prepared for it? Before we answer that question, let’s recall the role that man’s inventions have played on evolving our societal norms over the years. From the evolution of commerce to banking to recent techniques of sending money via email, one of communication from pigeon carriers to snail mail to all kinds of electronic modes available now, etc., our society has evolved and adapted to inventions (technological and other) that have woven into people’s lives as an integral part. Along the same lines, there is a massive force on social behavior at the moment, brought upon by all the myriad of information that is available about us online. I wrote on Quora about the different ways in which one can lose privacy today – for all those reasons and more, evidence of our behavior is smeared in bits of information all over the place. It is futile to fight it or try to revert or delete it all. And yet, I believe this is the among the most difficult changes inflicted on society by human inventions. Despite all the changes that have come about, the notion of a relationship role is one that has undergone little to no change from times immemorial. And I mean relationship in the broadest of senses – what a student is to a teacher, what a child is to a parent, what friends are to each other, etc. And despite the huge changes that have happened in the ways we communicate, how we handle these different personas have more or less remained the same. And today, this is all in jeopardy. Not only that, but it is rapidly changing – before we are ready for it. Previously, to impress a potential employer, we could put our best foot forward and know that that is going to be what counts for the most part. The equivalent of information leaks in that world would have been things like knowing a common intersection of people from one of your different worlds that may divulge undesirable information about you. This was not a common occurrence in the big scheme of things. Today, it is a reality everywhere. There is no place to hide. And this makes all the difference. Unfortunately, just as in any other case, technology will end up influencing human social behavior more so than accepted societal norms defining the future of technology in this space. We have to be more cognizant about this in our actions. Be it an educational institution that figures out just how much your tweets count towards your admissions or a student that figures out how to develop a social profile that augments their admissions – we will eventually reach equilibrium. Until then, it’s a rocky road ahead and we have to ride along! My First Days With A Small Screen iOS Device – No, I’m Not Ditching My Android! I’m not new to iOS itself – I was an early iPad user, just like many millions of people. But, I’ve always had an Android phone. Eventually, primarily due to getting used to SwiftKey on Android, I could no longer really use the iPad and so, gave it to my mom. Of course, it is still an amazing device – but, I type too much to be content with the iOS keyboard! But, lately, I’ve been itching to really understand the iOS vs Android experience and figured that I need to do it on the smaller screen. After debating if I really need another phone, I decided to compromise and just get the iPod Touch instead. WiFi connectivity is all that I need and it seemed to suffice for what I was looking to do with it. It’s been a few days and I’ve been doing several side-by-side tests of the ‘i’ device and my ‘A’ device, which happens to be the Galaxy Nexus. I don’t particularly want to write about everything – there are numerous iOS-vs-Android studies out there that go to excruciating detail about each platform and I don’t need to repeat that. However, I did want to write about a few things near and dear to the user experience aspects I consider important. Some apps that I did side-by-side tests on both the devices are Flipboard, Pinterest, Google+, GMail, Etsy, Pulse, Facebook, Instagram and Chrome. First about what iOS gets right. When you use the device, you realize that everything in it on the hardware and software front has been designed towards a common goal – a slick user experience. The radios, the processors, the graphics, the memory and how the operating system interacts with each one of these components – it has all been polished and optimized for that single goal of enhanced user experience. This results in amazingly smooth animations, a flawless touch interface and a generally pleasurable experience. Granted that it is not strictly an apples-to-apples comparison, but I have to say that in every single one of those apps, the iOS experience was better, evaluated on smoothness of scrolling, animations and speed. With WiFi state already active on both devices, a side-by-side test of Flipboard showed it loading and updating its content in <5s on the iOS and sometimes as much as 30s under the exact same WiFi at exactly the same time on the Android device. In fact, I could never get the Android Flipboard loads to happen in <15s in several tries, while the iOS was consistently <5s. The Facebook experience, putting aside the fact that the design elements still need work, was far smoother than my typical Android experience – on Android, the experience is extremely stuttery, photos take forever to load and it is overall, just frustrating! I found those elements were far smoother on the iOS – no stutter on scroll, loads quickly and the back stack operations are consistent. Most other apps had similar experiences – sadly, I thought that the G+ app on the iOS was smoother than that on Android! Pinterest is the one that comes closest on both platforms. It has no stutter on either platform and the load times are not so dramatically different – the Android side is still a few seconds slower – but it is not a factor of 4x different. It is more like 3-4s on iOS vs 6-7s on Android. I want to be clear that several disclaimers are applicable for this A/B testing I did. My Galaxy Nexus has a cellular radio, for one and has a lot more going on than my iPod Touch has. Further, my Android is constantly running a brand new beta version of the OS and several beta apps. But, on the flip side, the iPod has an 800MHz processor, while the Nexus has a dual core 1.2GHz processor! To talk about a few more things, the battery management on the iOS is done very well – even with heavy use, I couldn’t manage to drain the battery all that much. The battery on my Nexus is abysmal and I have to charge it multiple times a day. Although the cellular modem does drain a lot more, the iPod has a much smaller battery to its credit! The sharpness of the display, the beautiful photos and the sleek aluminum frame are among the other things I really like about the iOS side. My Nexus, despite the fact that it has the same number of megapixels (5MP) as the iPod, takes rather inferior pictures. Okay, now, before you write me off in the converted-to-ios-camp, let me talk about a few things I actually did not like about iOS. I can’t stop talking about the keyboard. In this world of predictive, gesture keyboards that I can use to type almost as fast as I can on a real keyboard, the iOS keyboard is excruciating! I’ve written about this before and I won’t say any more – but, it is a deal breaker. I would have to imagine that Apple is doing something about it very soon. Next, there is one thing that Android got right – and it is the software architecture around intents. It is powerful and really allows applications to seamlessly share data. I often found myself in a corner when I wanted to share something from an app to someone over GMail or for that matter any other app. I am not a native iOS mail client user and hence, the share to email option in iOS is useless to me! The other options are equally useless – I was sometimes able to copy text and paste it in another app, but come on, that is painful! After a few times of trying to share an image from my gallery directly, I finally got the hang of having to go to GMail and clicking on attachments instead – but, that is not a good experience. Of course, it never ceases to annoy me how content on YouTube (or other places) that is available on Android is just not available on the iOS. I have not figured out if this has to do with the different video/audio codec needs or something else, but, the exact same searches on YouTube will produce different results on iOS vs Android. And the latter is always richer, just to be clear! There are a couple of other minor things – such as the lack of a back button on the phone and the apps losing state when I come back to the home screen and go back to them. But, I think this is just about getting used to one style vs another. It is really hard to say conclusively why so many apps (almost all of them) fare so much better on the iOS. It may be because they are investing more on iOS than they are on Android – clearly, the extent of the gaps in the performance of the same apps is demonstrative of that. Pinterest, for one, has obviously narrowed the performance gap on the two platforms quite a bit. But, unfortunately, if it requires more effort to make that happen, that itself is a problem too! Aside from this aspect, I believe it also has something to do with the fundamental integrated hardware/software optimizations that Apple has done, the ease of programming using the iOS APIs and the simplicity-vs-options tradeoff that the platform has made, leaning more towards the simplicity part of it! In a nutshell, the one thing that bugs me the most about iOS has more to do with Apple’s business decisions – such as not allowing third party keyboards or other content. The software architecture constraints that lead to sharing state across apps far more challenging is also a problem. These are definitely deal breaking issues for me that I will not be switching over to an iPhone any time soon! But, I definitely have to admit that integrated hardware/software approach that Apple takes comes with a distinct advantage when it comes to user experience. I long for the day when my Android will have as smooth an experience as the iOS – but, it is admittedly a lot harder to accomplish in an open and split ecosystem. Such is the tradeoff that naturally comes with accelerating innovation from the ecosystem at large. And I’d rather stay on that side – Android is definitely getting better and better at the experience and the gap is not that wide to regret it. And as Android becomes more and more dominant, developers will take the efforts to create good experiences on it. I’m sticking to my Android – although I may dump my Nexus for the HTC One at some point! Of Course, The PC Is Not Dead, It’s Just Aging, Silly! The funny thing about data is, there are often multiple ways to slice it. And there is never enough of it. Take the recent (and not-so-recent, if you wish) reports on the death of the PC, for example. Gartner and IDC produced data about how mobile shipments are taking over and PC shipments are crumbling. As with anything, to look at the other side of the coin, there have been a lot of posts about how the PC is hardly dying, forget being dead! Particularly this one on TechCrunch that I really enjoyed reading! What’s all this data telling us? Is the PC dead? Could it be dying soon? Are the tablet and smartphone owners throwing out their PCs or donating them to charity? For all practical purposes, I’m using the term “PC” here to denote all desktop and laptop computers, including the Macs – I know, that’s outrageous, but, I’m sticking to it (and yes, I love my Mac, but am not ashamed to call it a PC in the context of this post!). Heck, we didn’t need a Gartner or IDC report to actually know that, did we?! Look around in restaurants, trains, subways, streets, malls, wherever and you know this is true – we didn’t think all these people sat around at their PCs to spend that time browsing instead of going about their lives before the era of smartphones, I hope! Shipments are trending in favor of mobile devices. Could it be that more people are becoming owners of multiple devices? 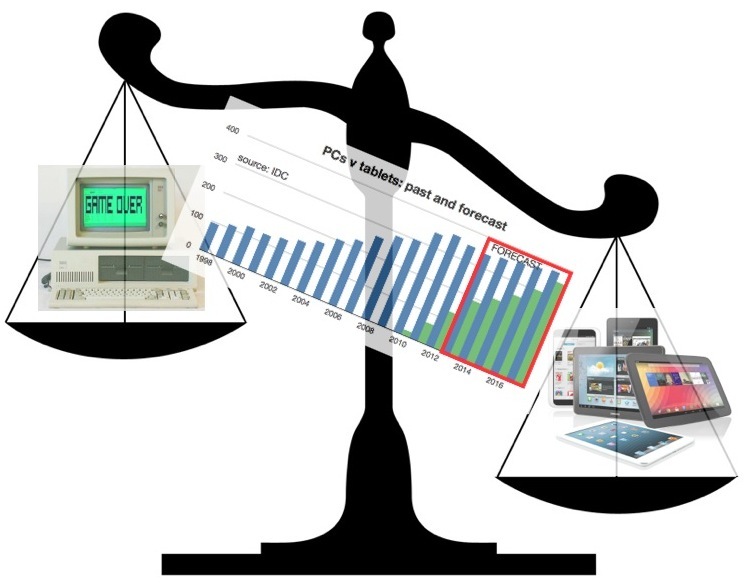 Or that the lifecycle of PCs are getting longer, as the TC post suggests? Percentage of time spent (or advertising revenue or sales, whatever) on mobile devices is up drastically. Of course, going from nothing to some number is an infinite increase in terms of percentages! Mobile devices, especially tablets, are still in the early years of adoption! This data, by itself, certainly says nothing about whether the PC is dead. The people that are writing about these massive numbers on usage, advertising revenue, internet traffic, etc. coming from PCs are all still right. But, the really important thing here are a few subtle points that require a more nuanced look at the data. Tablets and smartphones are increasingly becoming the consumption devices. They are easy to use, always-on and don’t require a drastic situation change to interact with. We don’t have to sit up in bed, we can just keep lying down and let’s admit, we love technology that allows us to be lazy! The use of a PC for leisure is declining. For the same reasons as above, we don’t need to be sitting straight to be leisurely connected to the Internet. And we can do it while watching TV. Two things we love doing, we can now do together, all while feeling restful! Data suggests people are doing exactly this! Enterprise content creation is still going strong on the PC. Okay, I’m an early adopter, but I don’t expect to be creating presentations and documents on my phone just yet. I’ve tried some of this and it is fairly painful. This needs more innovation and more importantly, we geeks are just not ready yet! But the reality is that more innovation on the mobile for the content creation aspects will come and come fast. We are not there yet, but it will come sooner than we think. Perhaps not for the enterprise use cases yet, but for the leisure, user generated content, it will. While the PC isn’t dead, it is definitely doing less than it used to. And it is going to do lesser and lesser for more and more segments of people in the coming years. It’s just aging, not dying yet! 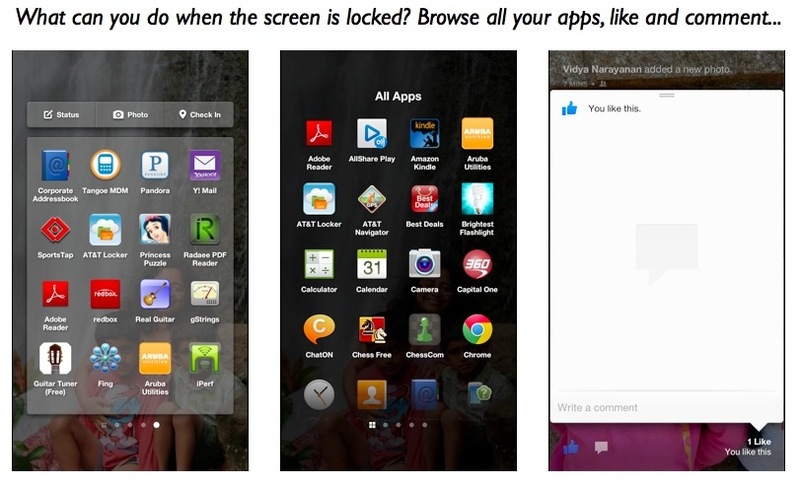 Facebook Home – Please Don’t Do This To Android! I like my Android device the way it is. I did try out Facebook Home to get a feel for it, but I won’t be going back to it anytime soon! You can read my full review on Quora here. In brief, it introduces a delay in all the important things I’d use my phone for. If you need to make an emergency call, forget it – you can like and comment on Facebook news feeds while your phone is locked, but getting to the dialer for an emergency call will take a few steps! A number of the normal Facebook frustrations on the mobile are now available on all our apps! All in all, I uninstalled after giving it a good shot and trying out various operations. I’m all for a contextual future – but, my contextual envelope happens to be beyond Facebook! 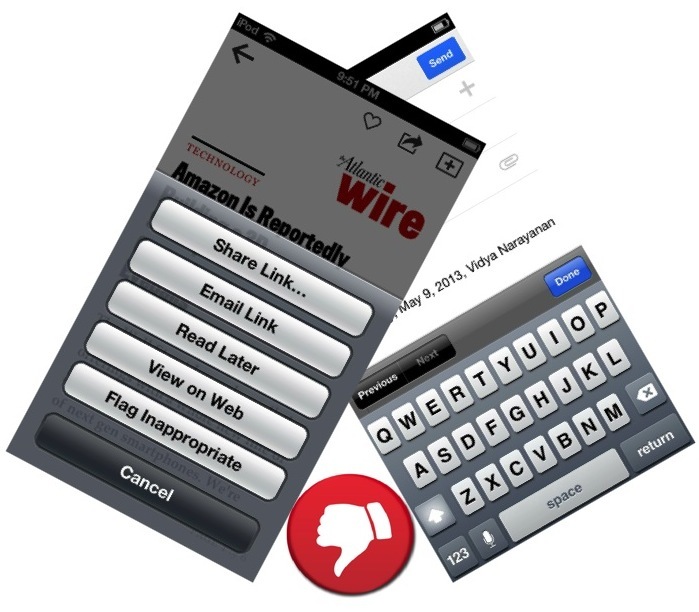 I blogged on Quora about how I don’t expect to be dazzled by the Facebook phone! I won’t get it to it all here again, but, the essence of it is that Facebook just hasn’t demonstrated that it gets mobile. 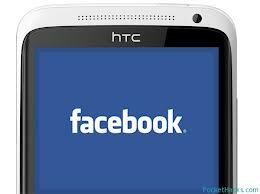 But, one thing the upcoming Facebook Phone is doing is endorsing Android as the platform of choice. “iOS first” is fast becoming a mantra of the past. The shift is not only in the developer community, but also among the users that are starting to discover the benefits of cool customizations! With The Galaxy S4, Has Samsung Really Fixed The Camera? The Galaxy S series of devices are not cheap. They are cheaper to the consumer than the iPhones, but, if you take a look at the Bill of Materials (commonly called BoM), the Galaxy S3 actually has a greater BoM than the iPhone already, with the S4 costing even more. This sparks the curiosity of whether Samsung is hurting its profit margins by selling this device (at least the S3, as we don’t know the pricing of S4 yet) for less than the iPhone, but that is not what I’m going to explore here. So many articles have been written about the differences between the Galaxy S* devices and the iPhone. 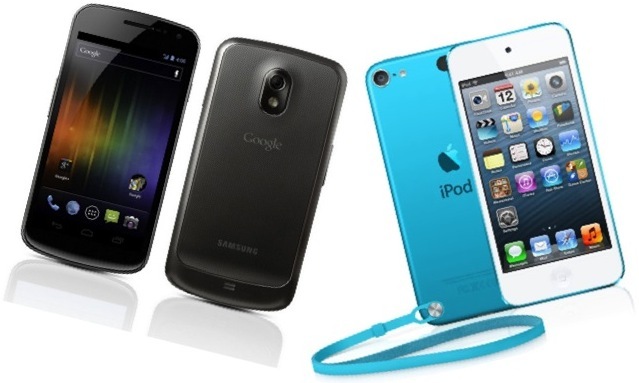 At the end of the day, it comes out as a draw or sometimes even as the Galaxy S3 or S4 being more feature packed. All true, if we take the totality of features into account. But, it is useful to look at this more closely, especially to answer the question “if price was not a factor, would the Galaxy S4 still win”? Because, if Samsung’s goal is to become known for making the best smartphone that exists, period, it has to win out on the features beyond the price. Here are a couple of examples where Samsung (and in some cases, Android) needs to think harder about bridging the gap. Moving to a 13MP camera is not what is really needed here – great marketing stuff, but what about photo quality? So many studies have been done on how the camera does in the two devices and some end up concluding they have comparable quality, but my own experience has been that the sharpness of the image and colors is simply better on the iPhone. I frequently find myself asking my friends with iPhones to take the same pictures I’m taking and send it to me (that’s embarrassing, but true!). Data gets sliced in different ways, but photography remains one of the top uses of the smartphone for users – even if it doesn’t top the list in terms of time spent. So, Samsung, I hope you are paying attention and really trying to up the bar on image quality with the next device! This has never been Samsung’s strong area – in the past, I’ve refused to own a Samsung phone because I didn’t tolerate its poor voice quality. Granted it has improved a lot and I currently use phones made by Samsung (and would even think about the S4! ), the voice quality is still a bit frustrating. This study seems to claim that the iPhone call quality is good – perhaps Apple got its act together with iPhone 5 (I will admit that I haven’t used it all that much, other than times when I’ve borrowed it from a friend), but, I remember a time when the iPhone sucked in call quality (note though, that call quality and voice quality are not necessarily the same thing!). Even though phone calls are not the coolest thing these days, when we have to make a call, it is critical. We cannot ignore call and voice quality just yet! I wrote about how the biggest fear of a smartphone user these days is running out of juice. It is true. Smartphone is undoubtedly my primary device at the moment. I don’t want to have to set up smart power management apps. I don’t want to have to moderate my use. Admittedly, I’m a power user and I know it will take a while before I can stop worrying about my phone’s battery life. But, my HTC Incredible II had a much better battery life than any of my Samsung phones. And 4G is just one of the reasons. Further, I don’t care that 4G is a reason – it is not my problem as the consumer! There may be more to this list, but these three aspects will remain critical to making the best smartphone on the planet! 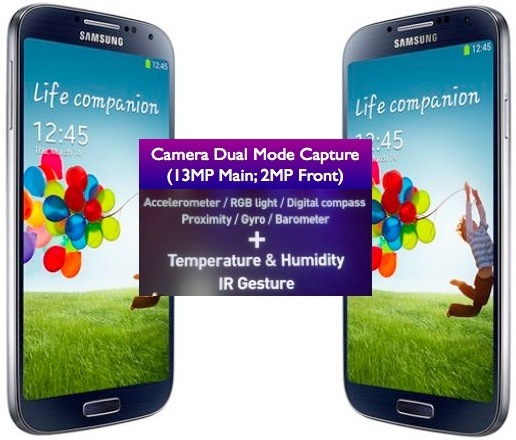 The Sensor Rich Galaxy S4 — Samsung Takes Over The Future! The S4 from Samsung is the talk of the town. It was a highly anticipated launch event and as with any such event, there was a good amount of criticism to go with it. May be Samsung needs to be better at PR; may be the storytelling needs to improve. Whatever be it, one thing you cannot accuse the company of at the moment is innovation on the product itself. The focus on user experience is clear and the device has been receiving good reviews already with the early assessments. The thing that strikes me the most is the sensor composition in this device – clearly, Samsung is setting itself up for the future. Let’s start with the camera. 13MP camera in a phone – that has to be a marketing tick box! The engineers know that the additional mega pixels are not buying anything on such a small device, with the real capabilities and limitations of the lens. But, that’s not the coolest part about the camera. It is the dual capture mode that is fascinating! Imagine the possibilities of inserting the front image or video into the captured scene! Trying to buy a dress? Take a picture of the dress and superimpose it on your photo captured at that moment with the front camera. Be in the party you are capturing. Capture the moment and don’t lose yourself. The possibilities are really amazing! The first round of this may not be perfect, but it is certainly heading in the right direction. Not to mention the ability to capture sounds with images. It is unclear how popular the sound capture would be – but, you have to applaud the company for its innovative thinking and focus on the user. And then come the other sensors. The Galaxy S family of devices have always been at the cutting edge of sensors, but this one adds the temperature, humidity and IR gesture sensing capabilities. With the IR gesture sensing, a whole new world of gestures come into existence. Touch gestures can go so far – but, IR gestures address so many limitations of always-on gesture sensing that exist solely with touch. Touch gestures always have this limitation where differentiating between an intentional gesture and an unintentional natural use of the device is hard. Or rather, it is at odds with natural gestures – the more natural a gesture needs to be, the harder it is to separate it from the unintentional use. Hence, often, an external trigger is needed to know that it is actually a gesture. However, the IR gestures can really help addressing this limitation and bringing the world of always-on gestures a step closer. 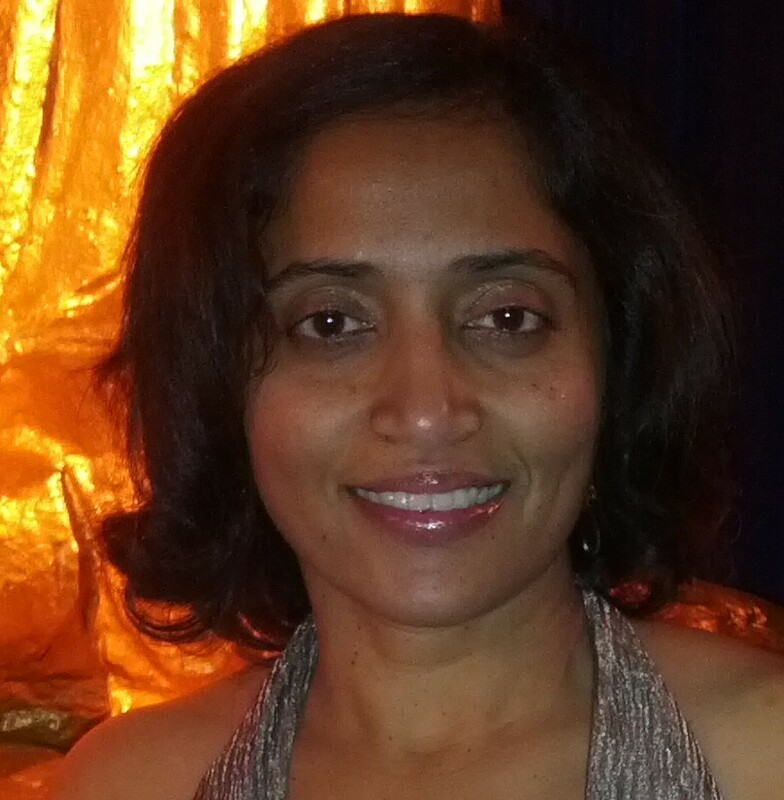 Temperature and humidity sensing are in early stages of use – however, interesting possibilities exist when fused with other types of data in terms of where the device is held (differentiating between a device that is in a pocket vs in a bag hung on a shoulder), what the environment is like and so on. One step at a time, we see that Samsung is getting closer to a truly personalized experience. It is interesting that they have chosen to go from “S Life” to “Life Companion” as the slogan for the device – it certainly seems like they are getting closer to delivering that experience! Cupertino really needs to be worried – what will the next iPhone have that will stump this?